"I am stronger than I ever thought I could be. I even have men approach me in the gym now to tell me how strong I am doing my 15 pull-ups." I am 37 years old and I started the program 9 months ago at 125 and dropped down to 122 while gaining a lot of strength. I only lost 3 pounds, which was perfect for me. It doesn’t sound like a lot but it definitely looks a lot different! I am stronger than I ever thought I could be. I even have men approach me in the gym now to tell me how strong I am doing my 15 pull-ups and asking me advice on how to do certain exercises. I went from the clueless newbie to someone who looks like they know what they’re doing! The book interested me immediately. 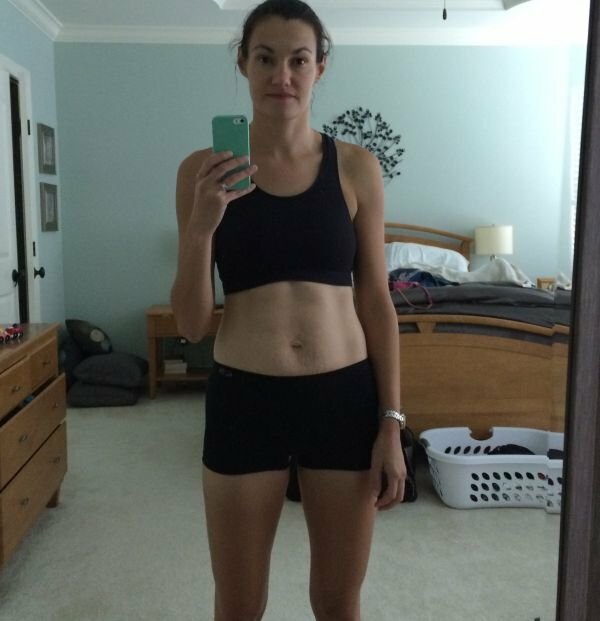 I was running/doing HIIT workouts almost exclusively and wasn’t getting the results I wanted. I wanted something that would take my fitness to the next level. I have always been “skinny fat” and wanted some definition to my lanky frame. I didn’t necessarily want to lose weight, just transform some fat into muscle. After reading the book, I knew the program would give me the results I wanted but I was terrified to start it. All the exercises looked like “boy” exercises. I didn’t know how to use a squat rack or do a bench press…it was intimidating to say the least. I decided to take a leap and give it a try. The first few weeks were tough, it was embarrassing not putting any weight on the bench press and trying to figure out how to do all the exercises. But after a couple of weeks, it clicked and I started making gains. It was both the easiest thing I’ve ever done and the hardest, at the same time. The principles are so simple–lift heavy, eat lean, stay within your calories and macros. But the continuous work and being consistent is HARD, especially with the diet. The meal plan/diet was a game changer for me. At first I was struggling to figure out how many calories I really needed and if my macros were right. I found it tough to get in enough protein and I was constantly second guessing myself. So I ordered the custom meal plan and it was one of those “ah ha!” moments. Within a few weeks, I was on track and was getting the results I wanted. Being able to have cheat meals really helps and keeps me from feeling too restricted. If I know I can have some pizza or some Mexican food every once in a while, I’m much less likely to “cheat” or fall completely off the wagon. I started seeing results pretty quickly and they were better than expected. I didn’t actually think I could have a six pack, especially only working out 4 days a week with very little cardio! I’ve never tried a “program” before. I was running a couple of half marathons a year and running/doing HIIT workouts but 3-4 times a week but never looked like I was in particularly good shape. I have always eaten healthy but having always been pretty skinny I have never had to “diet”. Learning about macros and how making changes to your diet can impact your results was key. The workouts are vastly different from anything I’ve ever done. 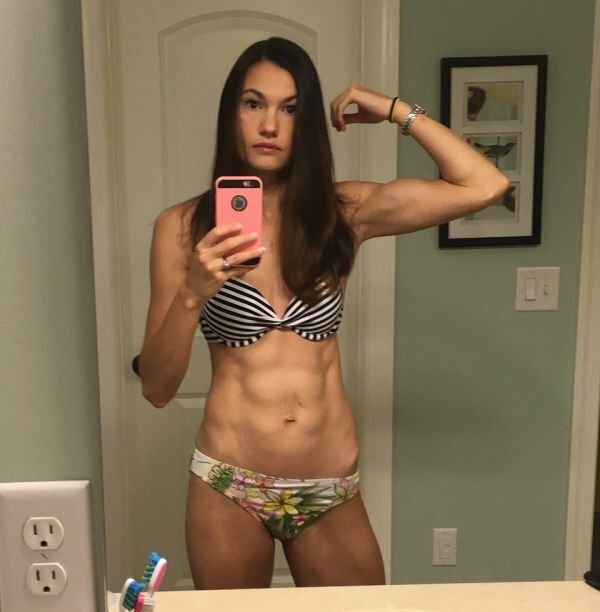 I have always thought that lifting heavy would make women look like dudes, a look I was never fond of for myself. I never thought lifting heavy would make me look more toned and lean. I am definitely more confident than before. Not in the “I’m going to wear my skimpiest bikini to the pool” kind of confident (because let’s face it, I’ve had 2 kids and things have stretched and shifted), but in the “I can do hard things” kind of way. I also have more energy and I have applied some of the “consistent gains” methodologies in other areas in my life as well. Put in the hard work now to guarantee your success in the future. I have and will recommend the program to anyone who will listen. When people can see real results, it’s not hard to convince them. My husband is planning on starting the program after his next marathon this fall. He has seen the work I’ve put in and the results…I’ve made him a believer. To the women out there especially – you’re not too old, too fat, too thin, too “mom”, too weak, too busy, too whatever to do this. I work full time, I have 2 kids and my husband often travels for work. This is something that anyone who WANTS to do can do. If you trust in the program and the science behind it (especially at first when the exercises seem awkward and you’re getting used to the diet) it will give you the results you want…guaranteed. I’m nowhere near “done” but I’ve come a long way. I use Legion Pulse for pre-workout. My workouts started to drag once I was getting pretty lean. I started taking Pulse before my workouts and it made a huge difference in the quality of my workouts. I was able to lift more and make gains much more quickly. I also use Legion Recharge which definitely helps reduce soreness and helps me recover quickly between workouts. Research Review: Can Alpha-GPC Supplements Make You Stronger?